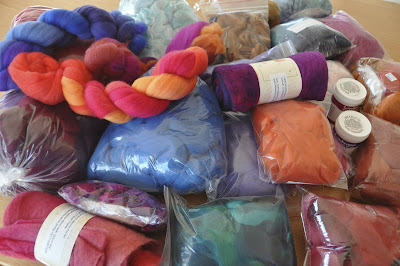 Today was Fibre Day at the Old Bus Depot Markets and I took advantage of the opportunity to enhance my stash and deplete my savings. It was lots of fun browsing through the offerings and I returned home with lots of goodies. Yikes Monica I forgot all about it. Maybe it's a good thing though because I am off to Perth soon so I will be visiting Dale at the Thread Studio. You are going to have fun with those.